CRON’s commitment to delivering exceptional quality prepress solutions and excellent value for money will be demonstrated during Labelexpo this September, with a showcase of the CRON HDI Flexo 600 and 1600 CTP models at the CRON stand (9B18). The HDI Flexo range, designed to provide outstanding flexibility, is available in three formats: 600 and 900mm for label applications, and 1600mm for general packaging work. All HDI Flexo models are compatible with thermal film, digital polyester-back flexo and letterpress plates. Additionally, the HDI 600 features a clamping system, which makes it possible to image on a diverse range of media, including thermal offset plates and dry offset metal-backed plates. The HDI Flexo models offer low-cost solutions for a wide range of applications without compromising on quality. Three model variants allow users to fine tune production to their print requirements: “S” variants have a maximum resolution of 5080 dpi, while “S+” and “H” variants have a maximum resolution of 9600 dpi. 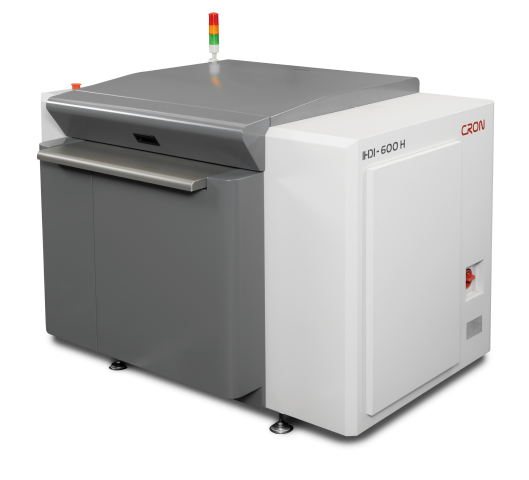 CRON’s digital plate imaging sets a new price-quality standard, bringing digital image control to Flexo and Letterpress plate imaging. “Prepress solutions for the Flexo and Letterpress markets have traditionally been very expensive to run and maintain, let alone the initial outlay, meaning that most label and packaging converters have been forced to outsource their prepress production. The CRON HDI Flexo are very competitively-priced machines in comparison, meaning packaging converters can bring plate production in house. This reduces lead times and significantly increases their flexibility to take on a wide range of production jobs”. A prototype of the HDI Flexo CTP was exhibited at Labelexpo 2015 and the range was officially launched at Drupa last year. After achieving notable success with its Flexo HDI range in China and Asian markets CRON is now set to focus its efforts in EMEAR and the US.